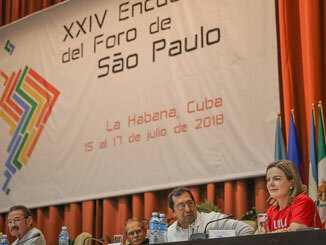 The 24th annual meeting of the São Paulo Forum took place in Havana, Cuba, between 15 and 17 July. The following report, by Leonardo Fernandes, was originally published here by Brazil de Fato. “We demand the immediate release of Lula, after a conviction and imprisonment without evidence, as well as his right to be a presidential candidate in Brazil’s October elections, respecting the will of the majority of the Brazilian people. Free Lula! Lula is Innocent! Lula for President,” the declaration reads. The Forum also defends the tenets set forth in the proclamation of Latin America and the Caribbean as a “Zone of Peace” and condemns the initiatives aiming to destabilize the continent, such as the noncompliance with peace agreements between the Colombian government and the FARC guerrilla movement, the recent violent protests in Nicaragua, and the “unconventional war” against the Bolivarian Revolution in Venezuela. The document also demands the elimination of all 77 US military bases in the region. The final declaration of the São Paulo Forum condemns several forms of colonialist oppression that still exist in the Latin American continent, such as the illegal occupation of the Cuban territory of Guantánamo by the United States, the usurpation of the sovereignty of the Malvinas by the United Kingdom, and the United States keeping Puerto Rico as a colonial territory. “We demand the total decolonization of the Caribbean and particularly support the independence of Puerto Rico. (…) We demand the unconditional, total, and definitive lifting of the economic, financial, and commercial blockade of the United States government against Cuba, and the compensation, to the Cuban people, for the damages caused in more than half a century of aggression of all kinds. We demand the return to the people of Cuba of the territory occupied by the illegal US naval base in Guantánamo. We support Argentina’s historical claim on the sovereignty of the Malvinas, South Georgia, and South Sandwich Islands,” the text reads. The São Paulo Forum also repudiates the immigration policy of the Donald Trump administration, in the United States, and calls for the strengthening of the CELAC (Community of Latin American and Caribbean States) to make regional integration and unity a reality. In addition to the first secretary of the Cuban Communist Party, the country’s ex-president Raul Castro, and the island’s president Miguel Díaz-Canel, the presidents of Bolivia, Evo Morales, El Salvador, Salvador Sánchez Cerén, Venezuela, Nicolás Maduro, and Brazil’s ex-president Dilma Rousseff also attended the meeting. Cuban president Miguel Díaz-Canel, spoke in favor of Brazil’s ex-president Lula’s freedom and said that, next to Fidel Castro, he was one of the creators of the São Paulo Forum, like Venuezuelan Nicolás Maduro. “The 24th São Paulo Forum was able to revitalize Fidel and Lula’s original idea. Having diversity as a stronghold, we must continue to build a space of revolutionary struggle and union to face imperialism and achieve happiness to our peoples,” the Bolivarian leader said.